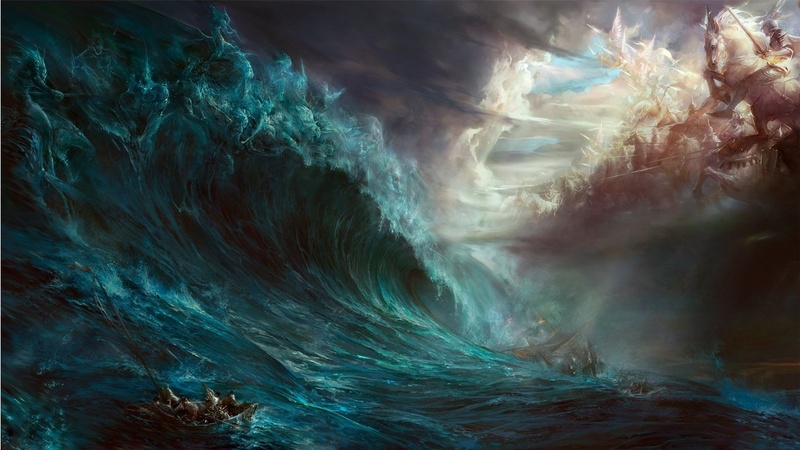 Although humankind was never reduced to eight individuals by a world-wide catastrophe, the myth* of Noah and the Flood gets one thing right: it is possible for life on Earth to be totally destroyed, whether by forces beyond our control, or as a result of humanity’s actions. Bad things happen to good planets. The good news is that Earth will (probably) continue to be habitable for another billion years or so. Even if it doesn’t, if Earth is destroyed by some cosmic catastrophe, there are probably other places in the universe friendly to living things. Life of some sort will abide somewhere. The bad news is that, because of the self-destructive activities of humankind, we are approaching a time of upheaval so disruptive that human beings could become extinct. Earth may have to abide without us. It is nearly certain that our species is heading for a self-inflicted catastrophe of one sort or another. If we aren’t decimated by the unleashing of some horrible weapon of terrorism or war, we will be consumed by disease and famines aggravated by climate change. Here is the background: By about 300,000 years ago, a species of primates—our ancestors—was showing recognizably human traits. Around 70,000 to 75,000 years ago we almost died out, perhaps due to the huge volcanic eruption at Toba. The entire human race dwindled to fewer than 15,000 individuals. After the last glacial period, around 10,000 BC, we acquired the skills of domesticating plants and animals, giving us a more reliable source of food, and our numbers began to grow a little faster. At that time our population may have been three to four million. The total human and livestock biomass at that time was about 0.01% of the mass of all land animals (not including invertebrates like worms and insects). Our growth rate increased greatly with the advent of the industrial revolution, and increased yet more as medical advances reduced mortality, soon peaking at over 2%. The rate has been dropping since then, and has declined to about 1%, but through most of our history it was much lower than that, between zero and 0.08%. If our fertility rate drops to below the replacement level, the population will keep growing for another 20 to 30 years, until the number of women of child-bearing age begins to decrease. If current trends continue, then by 2100 Earth’s human population should begin dropping slowly, after topping out at perhaps eleven billion. The Population Research Institute claims that the real problem is our declining birth rate; that once the world population starts dropping we will face economic collapse and never recover. Real-life observations indicate otherwise. There is no reason to think that the growth of world population caused our increased standard of living. The 50 poorest countries on earth are also those with the highest fertility rates (Population Connection), and we know how to change that. When we provide access to free education and affordable health care, family sizes go down, so we can address the problem by empowering impoverished nations to grow their economies and provide opportunities for all their citizens. Human population surpassed seven billion in 2011, and we are no longer a small percentage of the biomass. 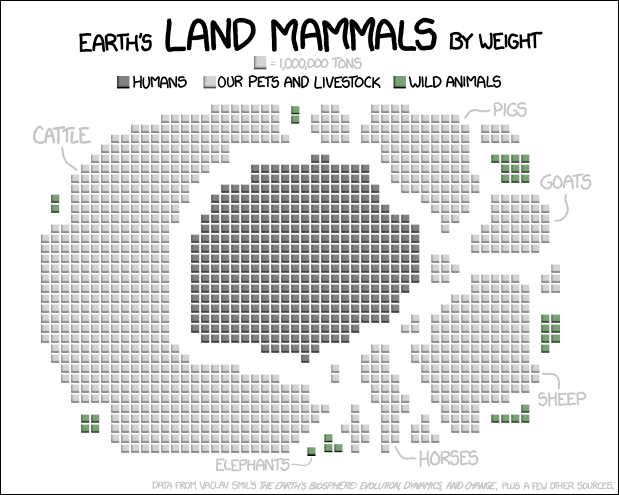 Total human and livestock biomass now comprises over 97% of the mass of all land vertebrates. We are squeezing out wild animals, taking over the world. It’s not surprising that species are going extinct at a high rate. We appear to be experiencing the most serious extinction event in the last 250 million years. 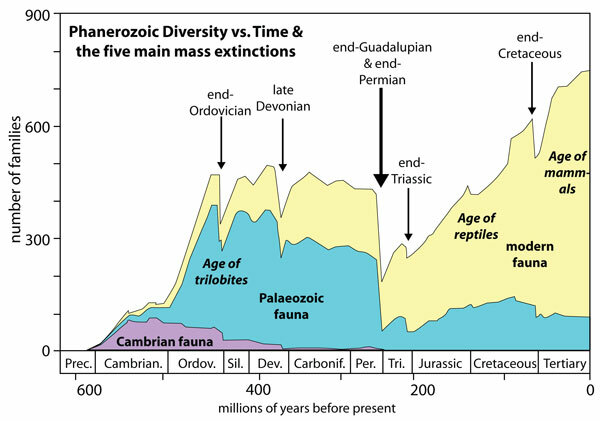 The Permian event killed off 90% of the species on Earth, over a period of 100 thousand years or so. 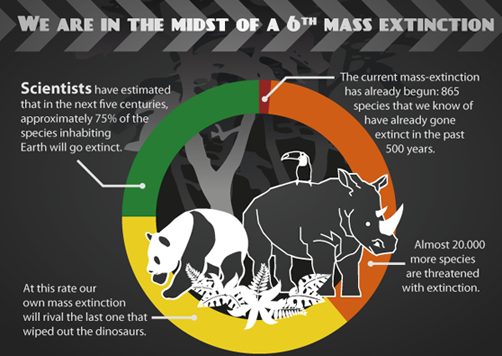 At the current rate of extinction, that degree of loss could take place within a few centuries. We will lose tens of thousands of species within the next several decades, if things don’t turn around soon. Douglas Adams died in 2001. The Yangtze River Dolphin was last seen in 2004. One thing may prevent this round of extinctions from being as terrible as the end-Permian: the fact that we are causing it. That is to say, as our own species starts dying off, we will be less able to keep up our assault on the rest of the planet, should we be inclined to. Even so, it is likely to dwarf the end-Cretaceous event that killed off the dinosaurs 65 million years ago. 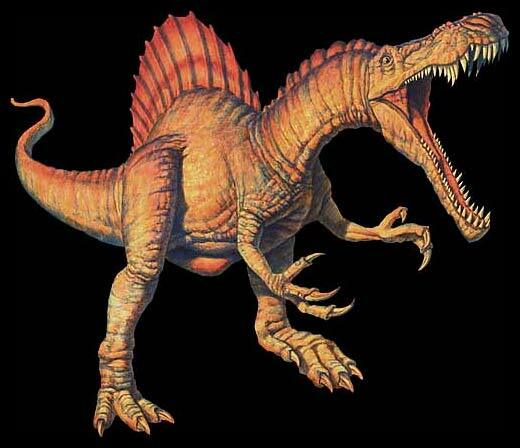 We could end up like the Spinosaurus , impressive in its day, but extinct. When any animal population gets too large, limiting factors come into play: food shortages or disease leave less individuals alive and healthy enough to reproduce, which soon brings the population down to a sustainable level. If the population gets too small, it may be unable to continue; it can go extinct. Humans are not immune from this balancing process; our technological advances can only delay the consequences. One way or another, our population will level off and drop to a sustainable level, whether by carefully planned interventions or catastrophic changes. We have already had a taste of the changes that may be dramatically evident by the end of this century. In the mean time, we are creating plastic garbage gyres and dead zones in the oceans, we are eliminating habitat needed by thousands of species, and we are adding megatons of greenhouse gases to the atmosphere. Unlike wild animals, we don’t use resources just to stay alive and reproduce. We also generate energy to keep warm where it is too cold for us, and keep cool where it is too hot. We transport ourselves and our goods around the globe, and use a staggering variety of machines and electrical devices. We may be able to deal with providing enough food. If we can find a way to distribute food where it is needed, producing enough is not the problem. We can grow plenty now for the world’s population, if we limit meat consumption . Raising livestock takes a great deal of land, water, and crops. If even Americans can cut back on the meat in their diet, we may hope to maintain world consumption at a reasonable level, assuming we survive the coming population crash. While our population is self-limiting at some point, the changes we are causing to world climate may not be. Technically, there is a limit to the degree Earth will change, but that change could blow past the boundaries of what is necessary for human life. The carbon dioxide we add to the atmosphere will stay there for centuries, and it will continue warming the Earth until the temperature reaches equilibrium. If we continue business as usual for a few more decades, living conditions at that equilibrium will be intolerable. *Myth: A memorable story or legend which may or may not be based on actual past events, intended to explain parts of reality in a way that teaches a lesson. 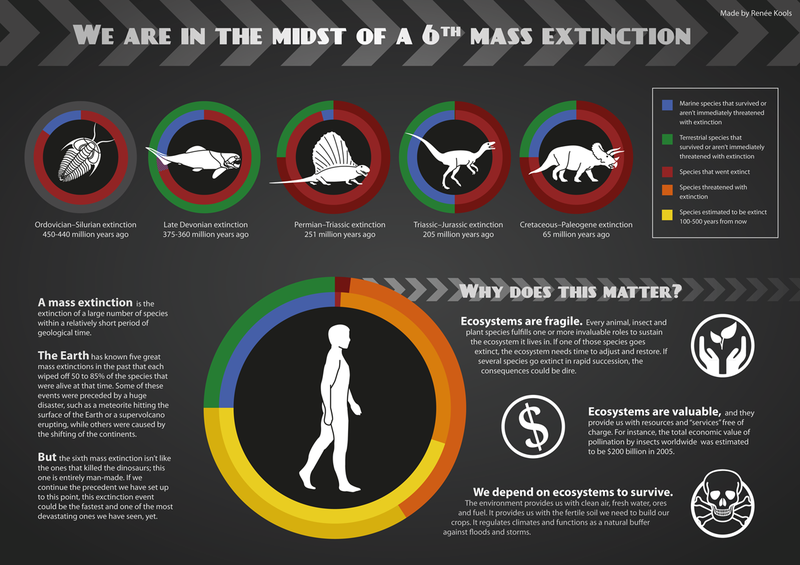 Title image credit: The Sixth Mass Extinction, Renee Kools.